Heat sesame oil in a large sauce pan. Sauté the onion until it is translucent. Add the ginger and garlic and sauté one minute more. Stir in the arborio rice to coat the grains with the oil. Open the can of coconut milk and stir together the liquid and solids if they are separated. Pour half of the can of coconut milk into a measuring cup. Add the 1 cup of white wine and enough chicken stock to equal 2 1/2 cups. Mix the liquids into the rice and bring to a simmer. Turn the heat to low and cover with a lid that is just off-center, allowing steam to escape. Check the risotto every 3-5 minutes, stirring and adding more chicken stock and the remaining coconut milk as the liquid is absorbed. Cook until the rice is soft and the texture is creamy. Season to taste with salt and pepper, lime zest, lime juice and fresh cilantro. While the risotto is cooking, clean the peas. Snap the tips off of each pea and pull off any tough strings that run along the seam of the pea. Set up a medium sized pot with a steamer basket, a small amount of water in the bottom, and a lid. Bring to a simmer. Just before the risotto is ready, steam the peas until they are bright green and tender but with a slight crunch. 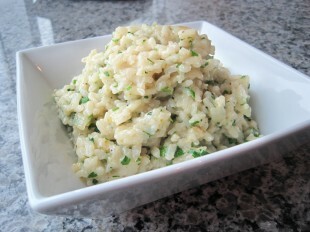 Season with salt and pepper and serve over the risotto. Very good dish. I wasn’t too sure about the combination of coconut milk and lime until I tried this. Delicious! I didn’t have the peas in the house and so left them off but I think they would have added a lot and so will try that next time. This risotto is just amazing! And easy to make…!